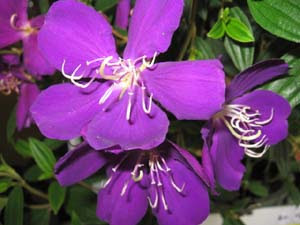 Ahhhhh....Tibouchina lepidota !! This gorgeous beauty was well-appreciated at our home plant sale this past weekend. Thank you to our many loyal customers plus all you "newbies" that found us! We had great weather up till Sunday, and then a few hardy folks still came out. We made some new friends with Brian and Bryan from the "Rakes and Blades" Garden Club of St. Pete, that came to visit and bought some of our special things. I am still trying to figure out how to upload pics from my new camera, but I tell ya, the site of B & B stuffing their back seat of their convertibles was such a site, I am sure it got the attention of many fellow road-warriors. Check out their website, it is awesome ! Okay, a few words on those who are chomping at the bit to cut back their brown stuff in the garden....WAIT a bit more ! Even as weather warms up, it is best to leave as much foliage on plants as possible to help resuscitate your plants. Keep watering to keep stress away (but remember county-watering guidelines), and save off fertilizing too much until warm weather returns and is constant. Happy Gardenin' !